Just wanted to wish everyone a very Merry Christmas and the very best for the New Year!! Make that Three. Our best to everyone. 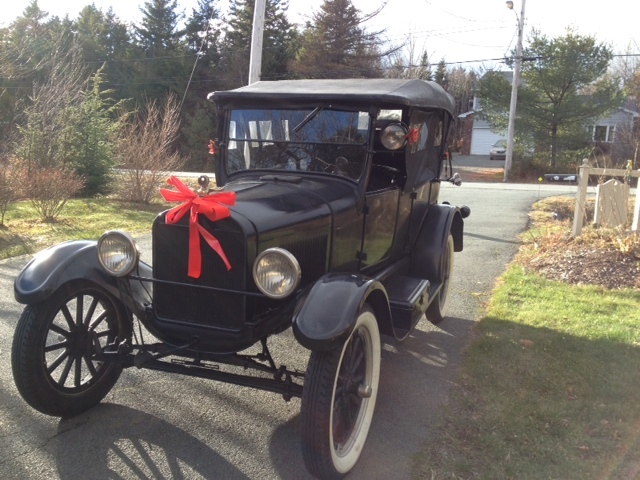 Merry Christmas and Happy New Year to everyone, this has been my first (half) year with a Model T and I've learned a ton since June from the folks on this forum! Merry Christmas everybody...nice sleigh there Mark. as for wise ? ... you drive a T so your mostly there! Let's be thankful for the gifts of friends, family & hobbies this Christmas. Merry Christmas, Happy New year to all. And thanks to the many of you who have answered some of my dumb questions in the past. Like Mark, being a newbie and needing help now and then, it is nice to have some advice, and also to watch some of the bantering!! 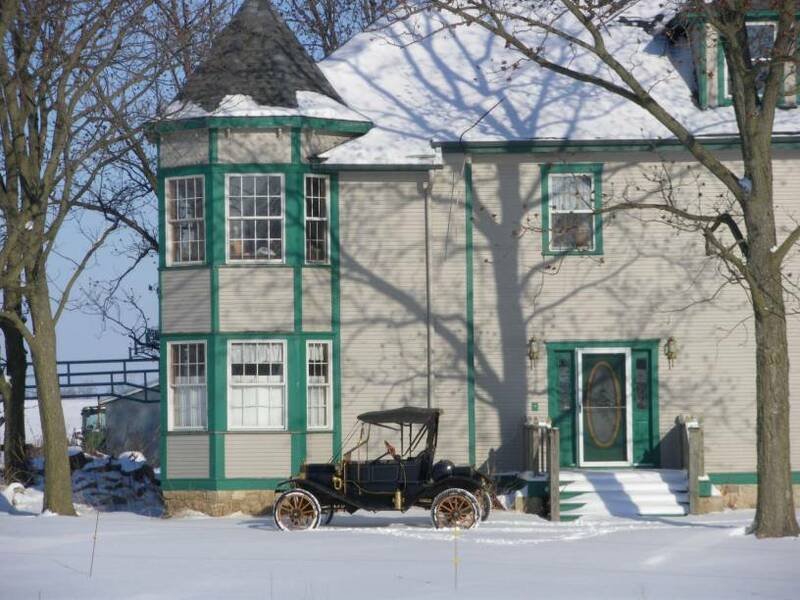 Now if it would only warm up enough to take one of the Lizzies for a drive! I�ve got so many people and so many other reasons that I know I am blessed. And the forum and you guys are part of what I�m thankful for. One of my favorite Christmas memories was not the presents or even the Christmas tree. For me it was starting the T and going for a ride on Christmas. 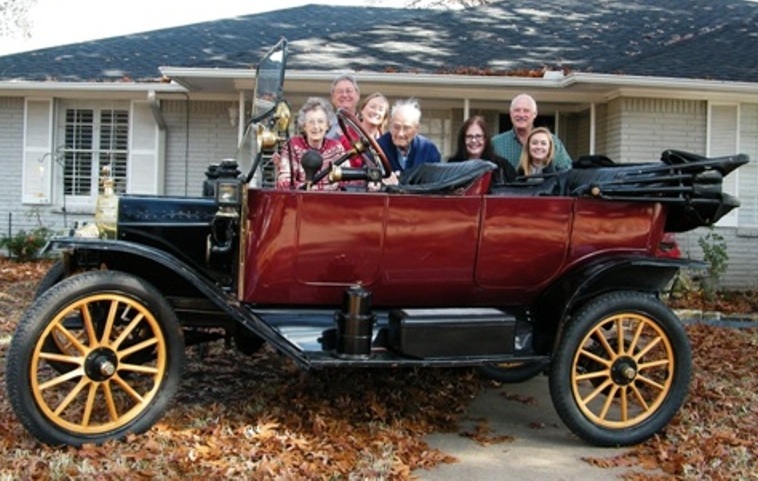 That may sound like a dumb idea � but for 14 or so years before I left home and then later when I was grown but able to visit home for Christmas, Dad and I would go for a ride in one of the Ts. I really enjoyed airing up the tires and then pushing the car outside (assuming the weather was not wet we went). Initially we would put on several pots of water to boil on the gas stove in Mom�s kitchen. By the 1970s we got modern and added antifreeze so we didn�t need to add any water. I would add gas, check the oil and walk around the car with the oil can and then turn all the grease cups a turn down. Chock the wheels and put the brake lever in neutral. We would jack up the left rear wheel, and be sure the battery had some voltage so we could hand crank the car on battery rather than mag. 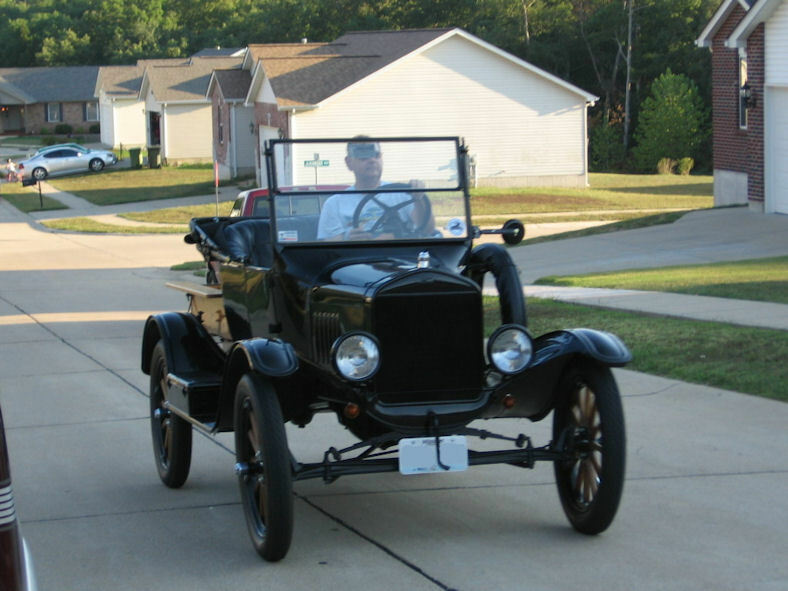 Dad never owned a starter equipped Model T. And normally we took the 1918 as it ran a lot better than the 1915 � not to mention it had tires on all four wheels. When everything was ready to crank we would go into the house to get the hot water. Close the radiator drain valve and then add the hot water. Adjust the carb a quarter turn more open. Spark up (don�t ask how we ops checked that every now and then) gas about three quarters down (probably a little more than needed). Choke it for a few pulls then switch on and be sure the coil was singing [note 6 volt DC is easier on the coils that 12 DC volts � don�t let them sing long on 12 volt DC.] I was always a little kid, so I would work the spark and throttle and Dad usually cranked it when it was cold until I was in Jr High. After that he would start off adjusting the spark and throttle and I would crank. It usually would start after a few more pulls (assuming we remembered to turn the gas on.) 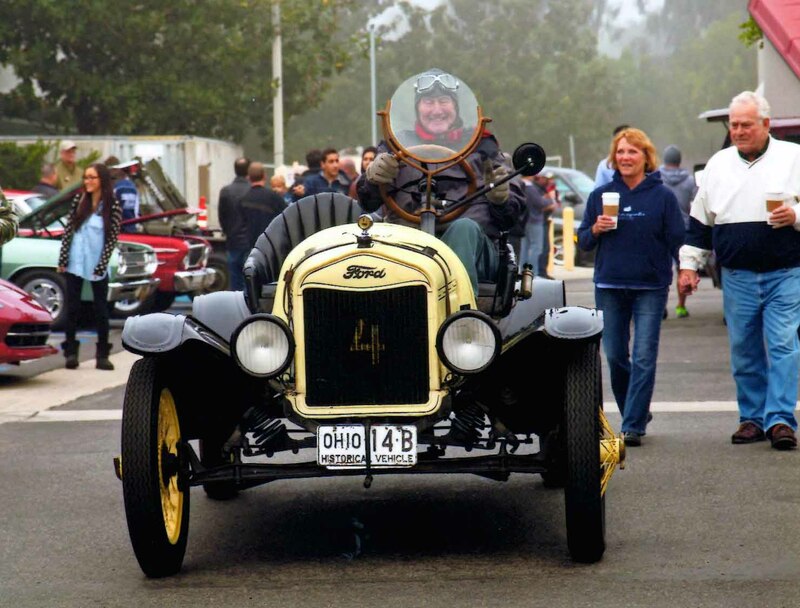 And since many of those years were before we put the 10w-30w oil in the engine � we would let it warm up a little before we tried to stop the rear wheel from spinning. We left the top two front floorboards out to let the engine heat come in. And as soon as it had warmed up enough that we could stop the rear wheel from spinning using the transmission brake without killing the medium idle engine we would let the rear wheel back down to the ground. If the weather was mild other family members would join us. But no matter how cold it was, as long as it was dry, Dad and I would go for ride. If you still have your Dad and Mom, be sure to give them call and hug if you can. And I would recommend put some thought into what type of traditions you would like your family to remember when they look back to some of their fondest Christmas memories someday in the future. Dena and I want to wish all of you a very Merry Christmas and Happy New Year. Travel safely during this holiday season. Enjoy your family and friends. 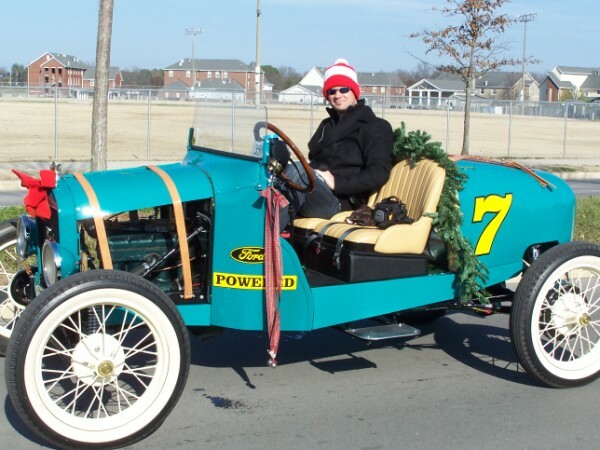 And thank you for supporting the MTFCA and the Model T hobby. Merry Christmas & a happy and prosperous new year, I have an open car no side curtains but it's not much different than riding my motorcycle so as long as it isn't raining it's all good. 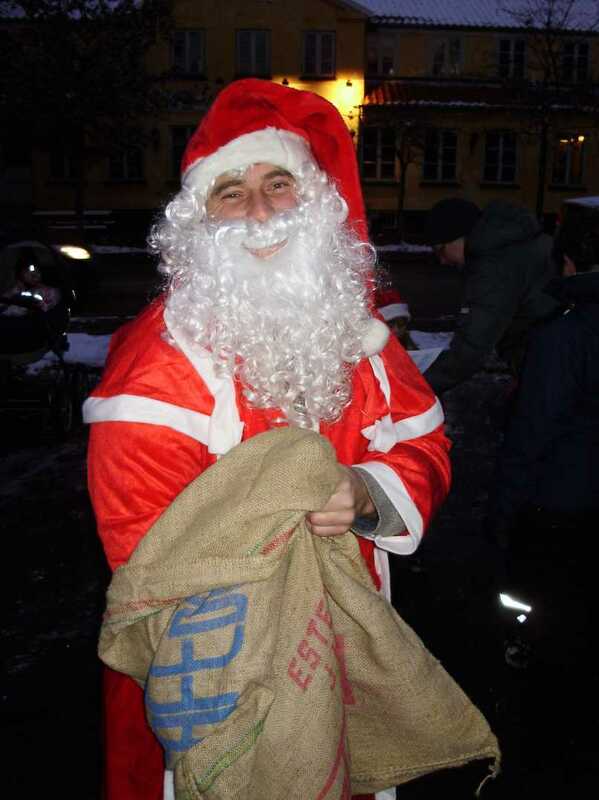 Merry Christmas from North Zeeland, Denmark. Drive carefully, and do enjoy a beautiful Christmas Holiday and a wonderful New Year! Merry Christmas, Gang! Happy birthday, Jesus! I thank you, Lord, for the breath of life and the many mansions you prepare for us�and the steep price you paid for that. I stand in awe of the countless stars in your infinite sky�how much greater must be the One who created them! How large is your ocean and how small, my boat�but also, how great your love that among billions of galaxies, You sustain each of us on this tiny, spinning marble. Thank You for the love of family, particularly my wife and daughter, and my parents now enjoying your eternal presence. Thank you for the food on our table and the home that keeps us warm and dry. Thank You for the close companionship of friends I enjoy face to face and for the camaraderie of those I only know through the words they broadcast with their fingertips. Thank you for the little, enjoyable things�everything from the harmless distraction in my garage that keeps my hands from becoming dangerously idle to the loyalty of a dog from long ago but still remembered, who, through innocent ignorance, mistook me for You�and this other yappy face-licker who still hasn�t figured it out. Happy birthday, Lord. Thank You. I hope everyone has A great Christmas with A Healthy and Happy New Year. 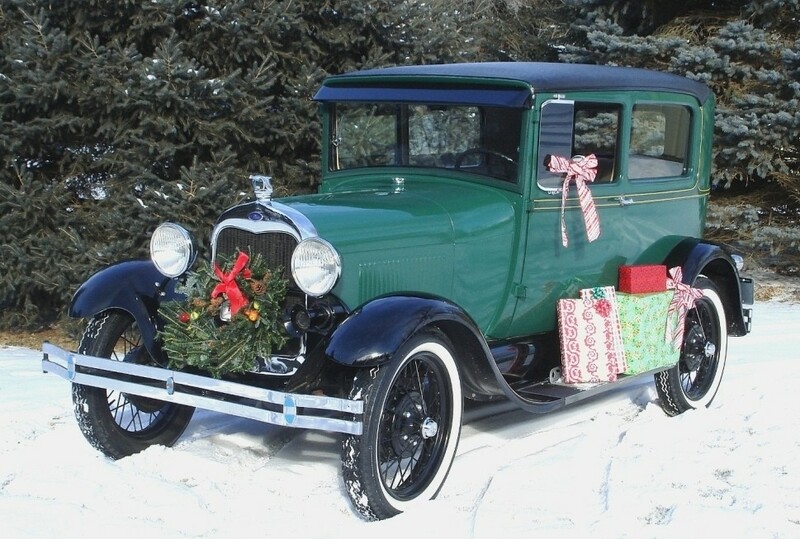 Sorry for the Model A photo, but the Ts have been in the Christmas pictures before and it was the 1929 Tudors turn... besides, the heading said it was OT. Yes to all a Merry Christmas and a happy new year. 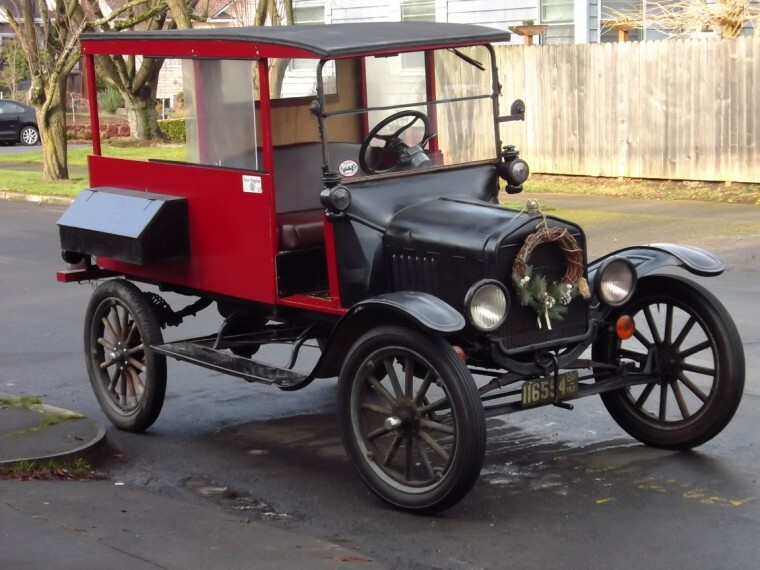 This has been my first year as a Model T owner and it has been a great experience ! My Christmas present came early. Her name is Audrey Renee Regan and she is my first baby granddaughter. She wasn't even a day old yet when I got to hold her. Life is good. Cool! Audrey is my sister's name. She was named after a favorite friend of my mothers. For a long time you never heard of a baby named that. Now there are two that I know about. Congratulations, John & Renee. Merry Christmas. What a great present. The picture worked when I reloaded. By the way, not many grampas have more hair than the baby. Looks like you do. Merry Christmas to everyone. John R,you are exactly 10 grand children behind. They are hazardous to your hair ,as you know mine is failing. 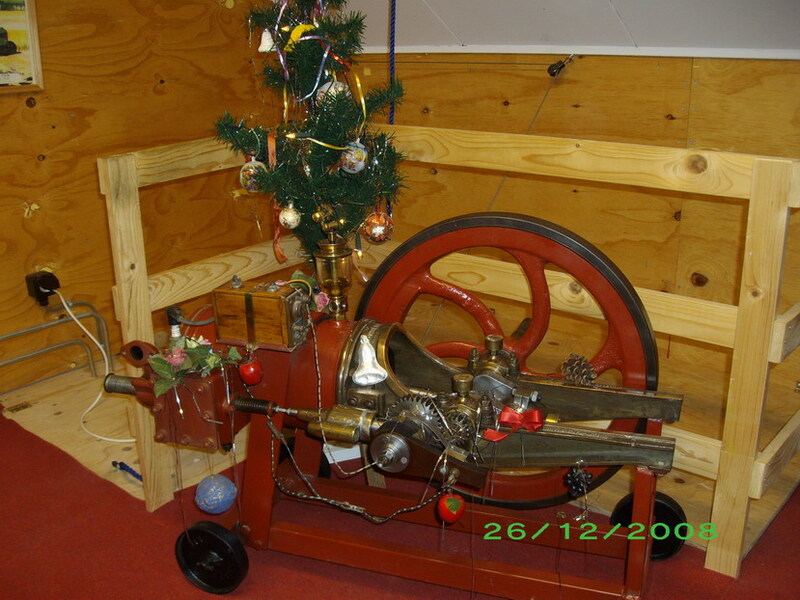 Merry Christmas to France, everyone.....Joyeux No�l. Prettige feestdagen en de beste wensen voor het Nieuwe Jaar. 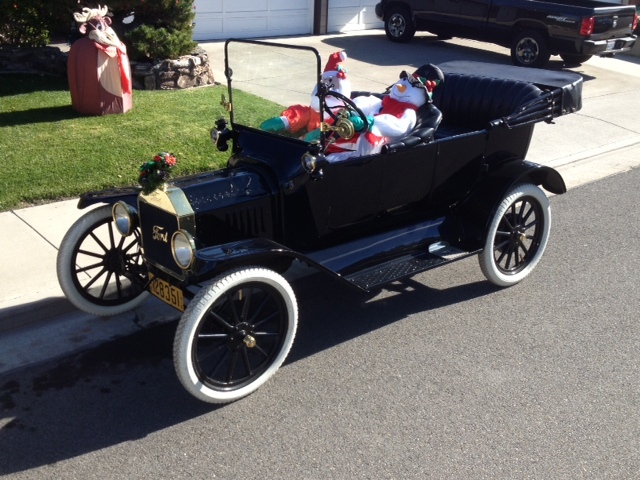 Merry Christmas and Best Wishes for 2014 to all my Model T friends. Be thankful if you have family and friends to spend the Holidays with, not everyone does. Insgelijks, Toon, voor jou en je hele familie! John we also got a new addition a few days ago. Here is Varrow Michael Vaughn about 2 hours old. John R and Mike congratulations. 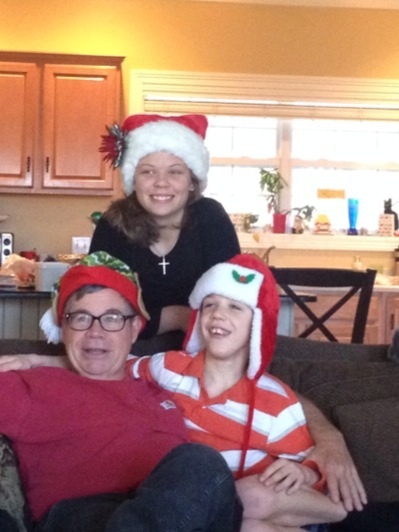 Grandkids are always great. Mike he looks like you. John I can't tell if there is a family resemblance or not but the hats are sure different. Merry Christmas and a safe, Happy New Year to everyone also! John R, congrats on that new first granddaughter. Can I "borrow" some of that hair of yours? My head sure gets cold in these Ohio winters! I got not new additions this year but I love the camaraderie here on this forum. Merry Christmas to you all. to the local car show! Merry Christmas, everyone! 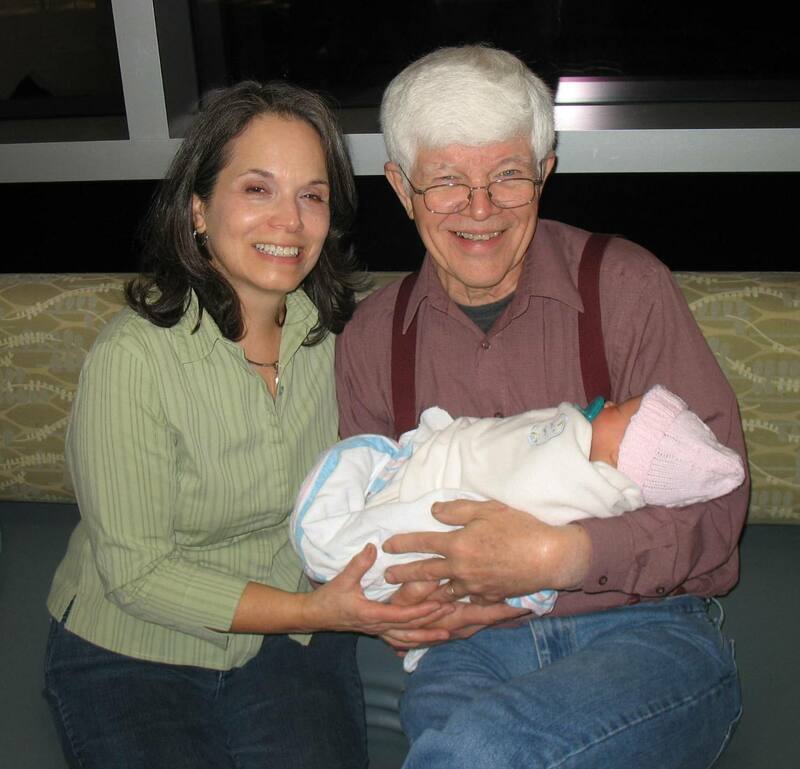 To those who have new grandbabies, that is a very special gift. 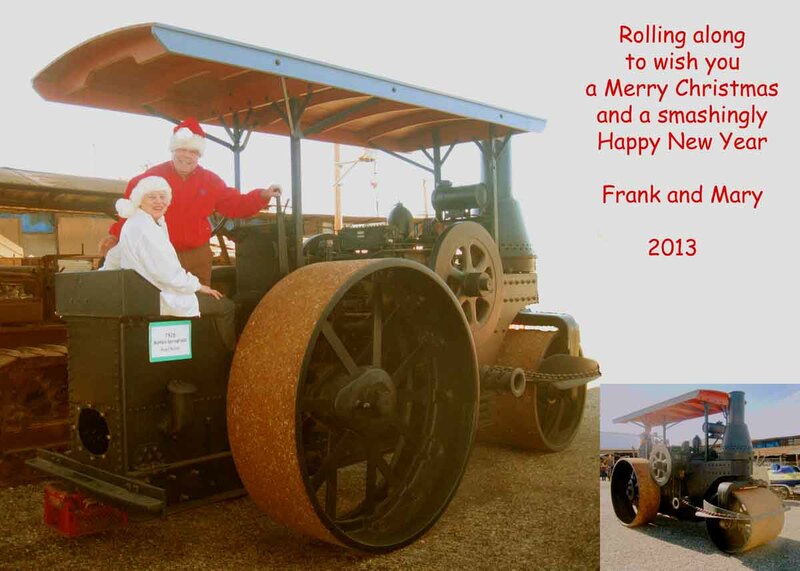 Merry Christmas too and happy New Year with fun miles behind your T's steering wheel! Happy tonite to be with my TN grand kids! We had most of the family together for dinner today - a blessing. Be grateful and Thank the Lord for our Good Health and Congrats to all the little ones that have joined us this past year! Merry Christmas and Happy New Year to all. I especially liked Hap Tucker's remembering when he was a kid starting the T with his Dad. Those kind of memories are real treasures. Also enjoyed looking at each member's pictures and profiles. 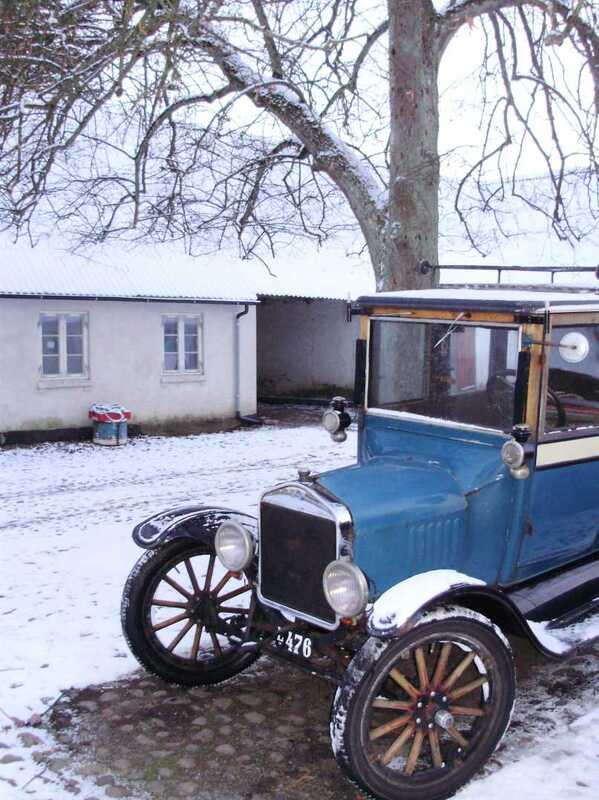 We are from all parts of the world but have a common bond - the love of old cars and especially Model T's. The picture below is with my oldest Grandson getting ready for the local Christmas parade. Yes it gets cold sometimes in Tennessee so we had to bundle up. May all you Grandpas live up to your kids expectations. Good Role Models are hard to come by in these days. So best wishes from Tennessee and may you have a prosperous 2014. Merry Christmas to you all, Old and New. May 2014 be the best year ever.